Or 6 payments of $124.83 What's this? The sporty and functional design includes all the information that enthusiasts can't do without. With Puck Air as your guide, you'll always know what to do. In particular, with the Easy Access System, navigating the computer menu has never seemed so easy! Puck Air Computer uses Mares-Wienke RGBM (Reduced Gradient Bubbles Model) algorithm. The RGBM takes into account the phenomenon of micro-bubbles in order to prevent their formation. In over 10,000 real dives monitored by Dr. Bruce Wienke in the Los Alamos laboratories, the formation of micro-bubbles has been studied and evaluated in order to better understand the mechanism behind how micro-bubbles are formed during a dive. Today it is the most evolved algorithm for reducing the formation of micro-bubbles without compromising dive times. Air Integrated computerized monitoring of tank pressure is used to determine a bottom time which depends not only on your depth, but also on your actual gas consumption, increasing your dive safety. In addition, the gas consumption (referred to the surface) is displayed on the computer for more control over your dive. The computer does this by sampling the pressure drop over time and giving you the rate of consumption in minutes remaining. If the time remaining is greater than the no-decompression limit for your depth it will display the shorter time allowed. The easy excess push buttons allow the diver to operate the computer in all conditions, even when wearing thick gloves. Navigating through the computer programs is extremely simple and very intuitive. There are three special function modes of Air, Nitrox and Bottom Time. 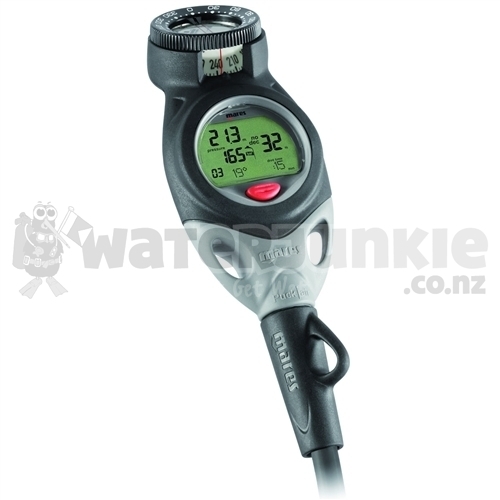 The Puck Air has a maximum depth display of 492' (150 meter), a memory capacity of 36 hours, runs on a user replaceable 3 Volt CR2450 lithium battery, power indicator, back lighting for low light conditions, has a plan mode display, can be used in both imperial or metric units, fresh or seawater settings, residual nitrogen reset, option to exclude audible alarms and uncontrolled ascents", has an ascent rate indicators and is altitude adjustable. The Puck Air also has a watch, date and temperature functions. The Puck has an optional USB interface for logging dives on your PC, SKU: MRSPCNMW PC Interface. The Puck knows that not all of us who dive are young and in peak condition, it address this with precautionary program settings that allow individual adjustment to more conservative dive profiles if needed. When you do multi-level, multiple dives during a single day or multiple dives over several days you can choose different setting levels in order to adjust your computer to a more conservative dives. The Puck Air has superior display readability. In order to offer an easy-to-read display Mares produced a wide computer display, with intense backlighting and high contrast. The computer featuring illuminated, oversized digits. Special attention is paid to maximize the viewing angle, to eliminate angular distortion and to always grant the best readability. The Compass is oil filled for a quick and responsive movement. Dual magnets give faster response and with a maximum working tilt angle of 20° ensures accurate compass headings. A Ratchet Bezel with compass headings in ten degrees increments and 30 degree indicator marks. Bezel has twin heading indicators for alignment of compass course, and a double lined lubber line across the compass face. A side window with compass degrees allows gun-sight accurate use when precise headings are required. Compass card is luminescent for low light conditions. Puck Air with Compass comes with a User's Manual and has a 24 month limited warranty.